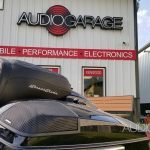 The owner of this 2016 Harley-Davidson Street Glide Special decided to visit Audio Garage in Fargo after hearing about our stereo upgrades from several fellow bikers. 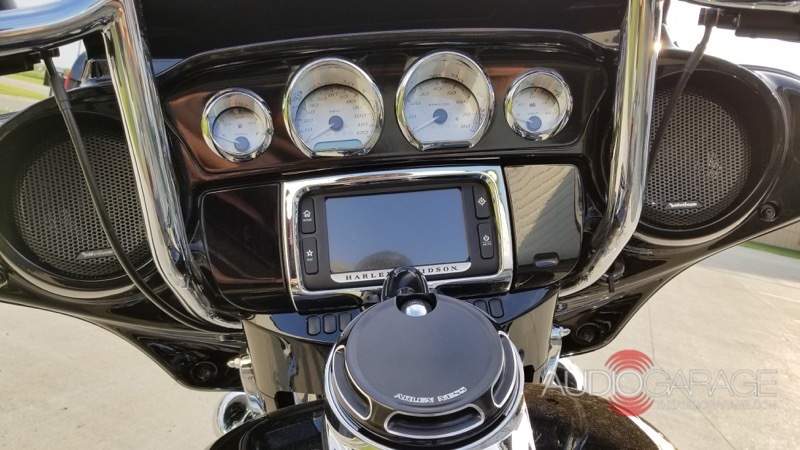 We’ve become one of the top destinations for Harley-Davidson audio system upgrades in Cass County and were happy to listen to the client’s needs and design a sound system upgrade for him. 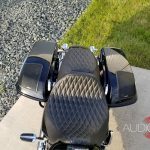 As is common with most Harley owners, he didn’t like the sound of the factory stereo and wanted something that would play louder with improved clarity. We knew just what he needed! The compact Rockford Fosgate amplifier fit perfectly under the fairing. The front speaker upgrades helped to round out the audio package. We started by removing the front fairing cover from the bike to gain access to the factory speakers. We removed the speakers so we could install a set of 6.5-inch weather-resistant TMS65 speakers from one of the Rockford Fosgate HD14-TKIT Harley upgrade kits. These high-efficiency speakers bolt right into the factory speaker enclosures without any modifications. 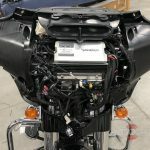 The next part of the installation was to run the wire harness included with the kit to the battery and the saddlebags for the new amplifier. We attached the four-channel TM400X4ad 400 watt amplifier to the included RFKHD mounting bracket, then secured the entire assembly in place on top of the factory radio. Next, we added a Rockford DSR1 digital signal processor between the outputs of the factory radio and the inputs to the new amplifier. 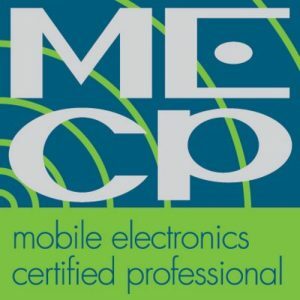 The processor will allow us to fine-tune every aspect of the audio system to the client’s preferences. The saddlebag kits by Rockford Fosgate look incredible. The client has plenty of sound to overcome the wind and road noise now. 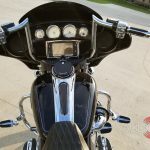 The client chose the Rockford TMS69BL14 saddlebag speaker kit for the rear of the bike. 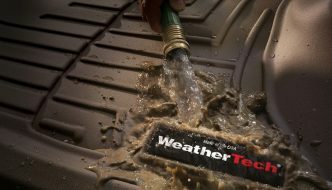 The kit includes a pair of 6×9-inch weather-resistant speakers, custom grilles and mounting brackets to secure everything to the factory bag lids. We cut out the top of the bag lids using the supplied template and mounted the speaker kit to the lids. This design eliminates the cost and considerable time associated with trying to paint new lids to match the rest of the bike. The factory radio was utilized as the source for the system. With the audio equipment installed, we reflashed the factory radio to remove the strange equalizer curve Harley uses. Next, we set up our Real Time Analyzer (RTA) microphone on the seat and connected the DSR1 to our shop computer to fine-tune and balance the output of each speaker on the bike, so music will sound natural and detailed, even with the volume cranked. Our lighting upgrades will definitely turn heads at night. Multiple lighting colors are easily selected. While the client was at our shop for his consultation, he noticed some of the lighting work we’ve done for other clients on the video screens in our display boards. 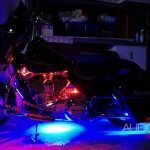 He started asking about adding lighting to show off some of the custom components he’s added to his Street Glide. Before we knew it, we’d designed a cool custom lighting solution for his bike and added it to the work order. The lighting system is based on an XKchrome RGB lighting controller. This controller connects to an app on the client’s phone using Bluetooth so he can change the light colors and patterns. Our installation team customized the lights we installed to suit each location and shortened the wiring for a perfect fit. We soldered all the electrical connections and then protected them with heat-shrink tubing before securing them in place. The dual zone design of the lighting system allows the client to choose different colors for the engine area and under the bike. A unique feature of the XKchrome controller is its brake light input. 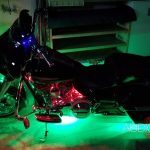 When the owner pulls the brake lever, as long as the lighting system is activated, all the lights turn red to help add visibility to the bike at night. After two days of hard work, we had the audio system dialed-in and the lighting upgrade installed and tested. 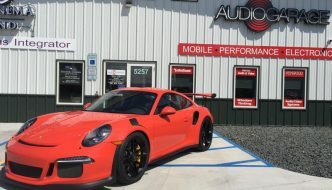 The client returned to Audio Garage in Fargo to pick up his Harley-Davidson and was thrilled with what we created. The stereo plays loudly and sounds amazing, and the lighting system looks awesome. We reminded the client that we back all of our work with a lifetime warranty on labor and that he can contact us anytime if he has questions. 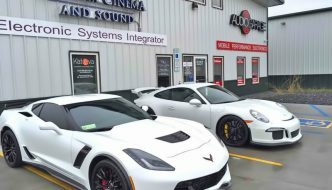 If you are interested in upgrading your motorcycle audio system or lighting, drop by our store or send us an e-mail using our contact page.